When Realtime Landscaping Plus is opened, you will be greeted with a Welcome Menu as shown in the picture below. Start a new landscape design from scratch. Open a design you have previously created. Open a sample landscape design. This is a good way to see what the software is capable of and to get ideas for your own designs. Start the Landscape Wizard. The wizard walks you step-by-step through the process of creating a basic landscape design. For details, see Landscape Wizard. View tutorials on our website. Tutorials are a great way to learn the basics of the software, and are a good supplement to this guide. 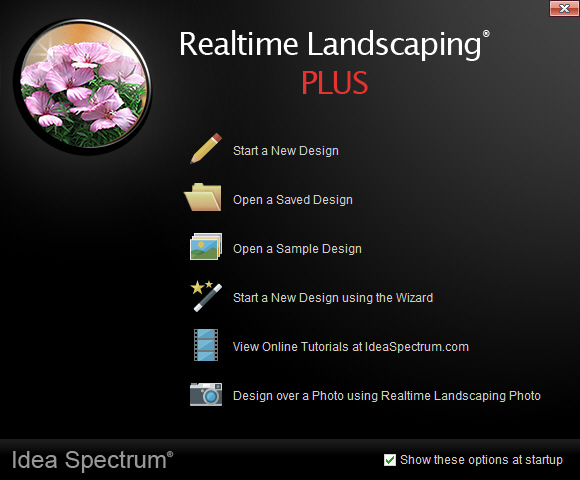 Close Realtime Landscaping Plus and open Realtime Landscaping Photo. Using Photo, you can design your landscape directly over a photo of your house and property. Uncheck this option if you do not want the welcome menu to appear each time you start the software. To access the welcome menu directly, click File and Welcome Menu. Exit the menu and start a new landscape design. This is the same as clicking Start a New Design.